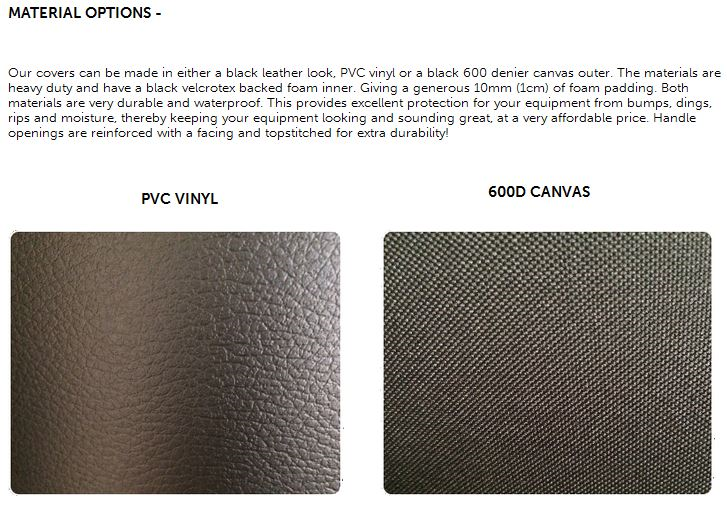 Our covers can be made in either a black leather look, PVC vinyl or a black 600 denier canvas outer. The materials are heavy duty and have a black velcrotex backed foam inner. Giving a generous 10mm (1cm) of foam padding. Both materials are very durable and waterproof. This provides excellent protection for your equipment from bumps, dings, rips and moisture, thereby keeping your equipment looking and sounding great, at a very affordable price. Handle openings are reinforced with a facing and topstitched for extra durability! We guarantee you won’t find better quality padded covers at a better price anywhere - A “Hot Cover” is an absolute essential to protect your equipment at all times but especially when it is in transit!! *COVERS ARE PRICED INDIVIDUALLY AND INCLUDE VAT. PICTURES USED ARE JUST AN EXAMPLE. "Excellent item, great price. Arrived swiftly and works great - cheers!" "Excellent description, packaging and very prompt delivery! Will def use again!A+"
"Quality item, rapid dispatch.superb service, great coms. A+"
"Great quality and very well made. Really does protect the speaker. Best covers on the market by a mile." "My second cover,and they are superb.. Have used the competition and these bury them!!"